Published Friday, March 25, 2011, OK personal/derivative use; link www.lovethatimage.com. These tiny pink orchids (anyone know the name?) are only an inch or 2.5 cm wide, and you can see they are dwarfed by the phanaenopsis orchids and maidenhair ferns in the background. Aren’t they adorable? I saw them just yesterday in Volunteer Park Conservatory. By the way, I’m getting closer and closer to getting my new book to the printer, and flowers and the Conservatory will definitely be involved! Stay tuned. Visit Pink Saturday, Macro Friday, Color Carnival, Mellow Yellow Monday Macro Monday, Ruby Tuesday, SOOC Sunday, and Today’s Flowers for more fascinating photos and if you have a minute, do click on Free Photos “next door” for an additional selection of pretty flower and scenic photos. The full blog here may be found at Sara’s Fave Photos. Your pink photo is awesome. Good choice of beautiful natural colours. Keep on clicking. How pretty! I haven’t seen these before. Ya know, God is an amazing artist, just look at those beautiful sweet flowers He made. I am always in awe at His box of colors and designs. Very pretty, a photo for sevearal memes. Isn’t is nice to see all the colors of spring?! The color is simply stunning! I’ve seen the tiny yellow orchids but not this color. I found out the name of my flower: Cistus purpureus description: This semi-hardy low growing shrub is suited to sunny dry borders. Deep purple blossoms are borne through out the summer, complimenting attractive dark green foliage and spreading habit. 1.m wide x 80cm. LOL Now you know why I visit the place so often. I like the contrast in the sizes. Great photo. The tiny orchids are the most interesting and beautiful of them all. Orchid is not an easy plant to grow, so I always admire people who knows how to make them bloom so profusely. I have never seen this variety of orchids before! They are so very beautiful! Great shot! This orchid is so pretty. Looks like very rare. Great shot! Congratulations on your forthcoming book. 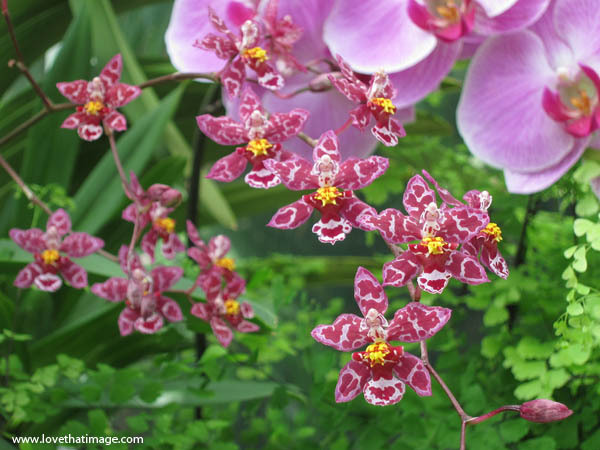 That orchid is so beautiful, maybe it is a hybrid of an Oncidium species.